Shinobu’s Vow has a very specific use that most Hunters are probably overlooking. There really aren’t a lot of Hunter gauntlets in Destiny 2 that stand out as being useful. In fact, I would bet they are some of the least used exotics in the class. However, since I’m taking the time to review every exotic Hunters have at their disposal, the gauntlets get some love too. That begins with Shinobu’s Vow, exotic Hunter gauntlets that were introduced with the Curse of Osiris DLC. The intrinsic perk for Shinobu’s Vow is called New Tricks. 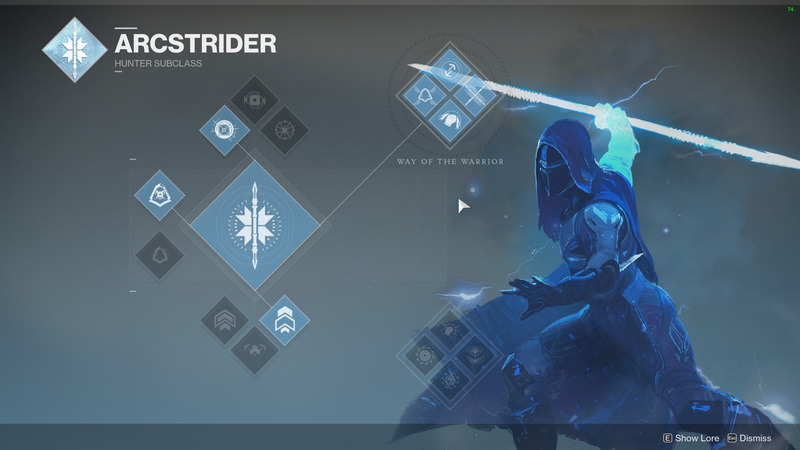 This improves the Skip grenade from the popular Arcstrider subclass, and grants you an additional Skip grenade. That alone affords Shinobu’s Vow a closer look, since extra grenades are a big deal under the right circumstances. If you’re not familiar with the Skip grenade, it’s the one that splits into several seekers when it reaches its target, then tracks them down and explodes on impact. Without Shinobu’s Vow, I wasn’t really a fan of this grenade, finding that I often only damaged foes and struggled to get a kill. I left it at home most of the time. With Shinobu’s Vow, however, I feel like you’re getting a little more damage out of the Skip grenade, even if that’s all in my head. I can kill several lower level enemies in PvE with just one, and the fact that I have two sits well with me. Considering the impact Shinobu’s Vow would have on PvP games in the Crucible, I can’t say I’m really a fan. As always, I can’t argue that it’s better than Knucklehead Radar or Gemini Jester. Yes, you get two Skip grenades that are more potent, but I didn’t find that I ended up with drastically more kills than I was getting previously. If I’m going to use an exotic armor piece, I need to feel a clear advantage during the matches. Where I think Shinobu’s Vow could shine in PvP is any time that you need to complete a challenge that requires grenade kills and you’re committed to using a Hunter. You get two grenades, and they are a bit more beefed up than normal, so this would make sense. Any other time, though, and I’d skip (get it?) Shinobu’s Vow in PvP. Moving over to PvE, I think the obvious choice for Shinobu’s Vow would be in a Nightfall where Torrent is active. Torrent is a buff that reduces the recharge time for your abilities, including grenades. With Torrent active in a Nightfall, you’re getting a grenade every five or so seconds. If you have two, as you would with Shinobu’s Vow, you almost don’t need guns, and I’m being completely serious with that. You just toss those Skip grenades until your arm falls off. 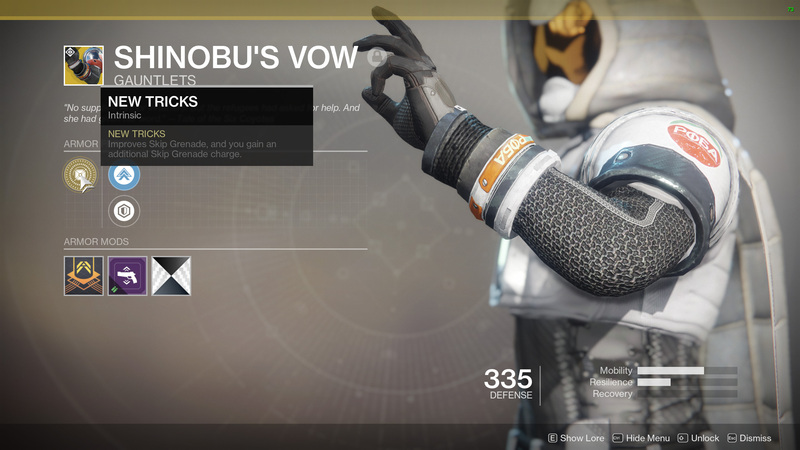 Beyond Torrent in the Nightfall, the only other PvE situation you’d want to use Shinobu’s Vow is probably for a challenge, like I mentioned in the Crucible breakdown. If you need grenade kills, this exotic will be there to help Hunters out. Otherwise, stick with the meta. You can learn a lot more about how to be an elite Guardian by visiting the Shacknews Destiny 2 complete strategy guide.